Love goes with you… | amen and ehmen! A snapshot of Ross and I when I first met him in person. He loved God, his friends and his bikes. 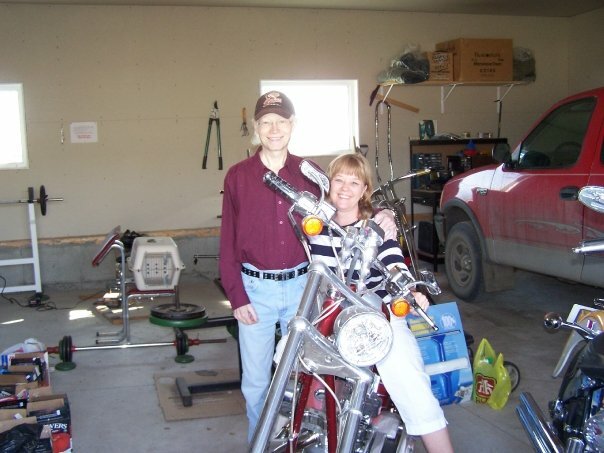 When this was taken in the summer of 2009, he had not been able to ride for quite some time. Our prayer during that time was that God would shower him in both peace and comfort as he continued his battle with cancer and that he would regain enough strength to ride his bikes again. God answered those prayers and Ross took a little excursion on this very Chopper just a few months before he passed….God is good! Writer’s Note: Besides Denny and Neil, Ross was one of the first across-the-border friendships I forged. We talked back and forth online and on the phone for quite some time as he battled cancer and it was so special to finally get to meet him in the summer of 2009. What is below was written after my daughter and I visited him again, just six months later in December 2009. This time he was in the hospital and he passed just a month or so later. In our many conversations, he always made me promise I’d write a book one day and include his story. Below is an excerpt of the “Ross Chapters” from that future book. What an awesome soul this man had and, though his battle was hard, his transition to his heavenly home was peaceful and beautiful just as we had prayed…thanks to our Heavenly Father and his dearest earthly friends. He sat in front of us, cloaked in robes and blankets. His skin was pale with a yellowish tint; his face sunken and pinched. The smell of sickness permeated the hallways, freely flowing into the room and assaulting our senses, trying boldly to break our spirits and our hearts during this most wondrous of seasons. And, yet, peace—a heavenly, sweet peace—radiated from his very being. At a time when you would expect him to be experiencing relentless pain, he smiled gently and contentedly as if he himself were sitting in God’s lap. He was living completely in the moment and enjoying the love of his friends and family, while at the same time seeming to live in another dimension secretly basking in the glory of God and enjoying his new life of no pain. His face would especially light up when his “earth angel” was near. It was obvious God had introduced Denny and Ross at just the right time nearly five years ago. His beloved son was lost and Denny and husband, Neil, were the only shepherds that could help him find his way home. God knew it. Ross knew it. Thank God, Denny and Neil knew it too. And, what a journey it had been. Many miles they had traveled together, wandering side-by-side through many a desert and dark valley. Sometimes Denny led with the other two in tow and sometimes it was Neil. And, then, there were days like today, when it was obvious that Ross was at the forefront where he belonged—the promise land in his sight. Neil gently laid his hand on Ross’ forehead as Denny leaned over to kiss him tenderly on the cheek. Ross’ breathing seemed to stop as if trying to hold onto the moment; to absorb and pack away as much love as possible to take on his journey. Love, after all, was all that he could take with him on this final leg. Fortunately, it was all that was needed. Speaking of love, it was through friendship and circumstance that this trio had learned the true, biblical definition of love. Sure, each of them had felt and given love before, but not like this; not the kind of love that Jesus gave; the kind that would make each one willing to lay down their life for the other; the kind that was just as important in death as it was in life. It’s always pretty spectacular when you realize that God has been working in your life; when you begin to see what seemed like the most horrible of circumstances becoming one of the most beautiful things you’ve ever known. It makes it hard to be sad when you look at it that way—through God’s eyes. The challenge then becomes to take what you’ve learned and make the world a better place. Not to let all that love be buried or put away in a scrapbook somewhere, but instead to keep it alive; to keep Jesus alive by continuing to love completely and unconditionally. Oh the memories that get stirred up. So thankful Brenda that you were a part of this incredible journey of love and sorrow. Den, I, too, am glad that God picked me up and put me on this path and purpose, despite the pain; for I know that He has a bigger plan and the story/stories that result will help others and further His Kingdom. Just want to be obedient and fulfill the purpose for which He has entrusted me. Love ya.